Photograph of the patient’s multi-dermatomal vesicular rash. Lesions are shown on the right face, neck, and chest. 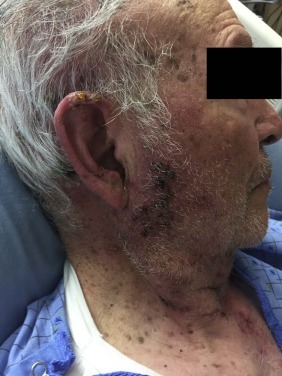 An 88-year-old man presented to the emergency department with dizziness and vesicular lesions in various stages of healing on the right lateral face, right ear, arms, legs, and chest. Incidentally he reported a ground-level fall in which he struck his face 2 days prior. The facial lesions were thought to be cellulitis, and he was treated with antibiotics. He returned 3 days later because of lack of improvement and was admitted. His past medical history was significant for chronic hearing loss, remote cranial surgery after head trauma, coronary artery disease, and a recent hospitalization for diverticulitis. He had primary varicella in childhood and had received the shingles vaccine. On examination the painful vesicles were most prominent on the right face near the ear (Figure). There were also lesions on the right chest, arm, and leg. The following day, lesions were noted on the left arm and leg. Neurologic examination was significant for ataxia, memory deficits, and bilateral hearing loss. No oral or ophthalmologic lesions were noted. Computed tomography, magnetic resonance imaging, and magnetic resonance angiography brain were negative for acute findings. Varicella was detected by polymerase chain reaction in lesion fluid. Because of the multi-dermatomal nature of the rash, he was started on intravenous acyclovir. After 5 days he was transitioned to oral valacyclovir and continued this for a total of 10 days of therapy. Human immunodeficiency virus test results were negative. Protein electrophoresis was normal. He had no signs or symptoms of internal malignancy. Upon discharge, the lesions had crusted, mental status had normalized, and ataxia had improved. A previous review studied 28 case reports of disseminated zoster in immunocompetent hosts. Cutaneous dissemination occurred 1-12 days after the dermatomal rash. The most common primary sites were within the face region.5 Our patient’s presentation was consistent with these findings. However, his history of trauma preceding dissemination was unique. Previous studies have shown that recent trauma is a risk factor for dermatomal zoster.6 One study found that zoster patients were 3.4 times as likely as controls to have experienced trauma in the week before rash onset. Furthermore, patients with cranial dermatomes involved were 27.5 times as likely to have had cranial trauma in the week preceding.2 Interestingly, although trauma has been described as a risk factor for dermatomal zoster, to our knowledge it has not been established whether trauma is a risk factor for disseminated disease. Our patient had a unique presentation in that he was seemingly immunocompetent and had cranial trauma preceding zoster, which later disseminated cutaneously. This case is important because the association with trauma can confound the diagnosis, and early recognition allows for more rapid treatment. It also alludes to the potential for trauma to precipitate dissemination of zoster, even in an immunocompetent host.